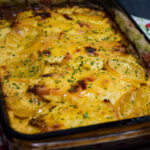 This Butter Baked Chicken is an old recipe I had totally forgotten about until just recently. I will sheepishly admit that boneless skinless chicken breast is not one of my favorite ingredients as it always seems dry, so I tend to avoid it if I can. My husband actually loves it, so I've been trying to make more chicken meals for him to enjoy. When I found this Butter Baked Chicken in my files, I decided I needed to try it again. After making it a few days ago, I wondered how I had forgotten how amazing it tasted. I keep forgetting that one of the best ways to dress up a boneless skinless chicken breast is with a few dairy products. Every time I do that I find I actually do like chicken breasts. Now if you're like me and don't really like chicken breast, this Garlic Cheddar Chicken recipe might change your mind. It has two of my favorite ingredients, garlic and cheddar cheese, and it's become one of my favorite ways to make boneless chicken breasts. 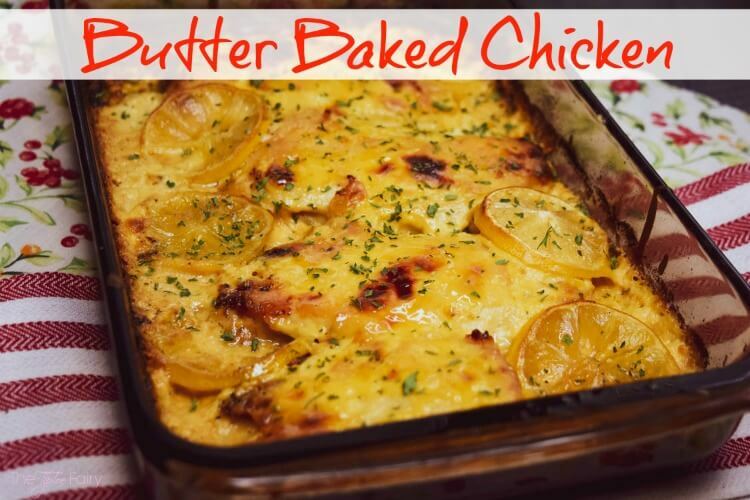 When I made this for dinner the other night, my family loved this Butter Baked Chicken, including the picky ones! I think it's the butter and the evaporated milk that make this so incredibly yummy. I really like using evaporated milk in place of regular milk because I like the flavor. I often use it in recipes that call for regular milk. Another dairy staple I always keep on hand is real butter. There is nothing like using butter in your cooking! It just adds a richness to whatever you make -- that yummy buttery flavor. 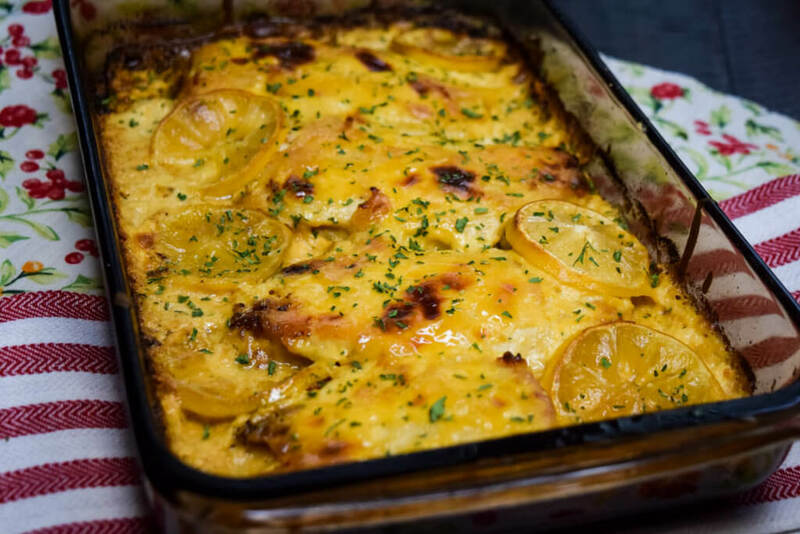 I think the secret to this Butter Baked Chicken recipe is the chicken frying in butter while it bakes, so when it's time to add the milk/soup mixture to the dish, you've already got fried chicken! If you don't keep evaporated milk on hand and you want to make this recipe, you can totally substitute whole milk, half and half, or cream -- or even buttermilk. These all will work really just fine. Though, I would suggest skipping the lemon slices if you use buttermilk as it might end up a little too sour. Buttermilk adds just the perfect amount of sour on it's own. 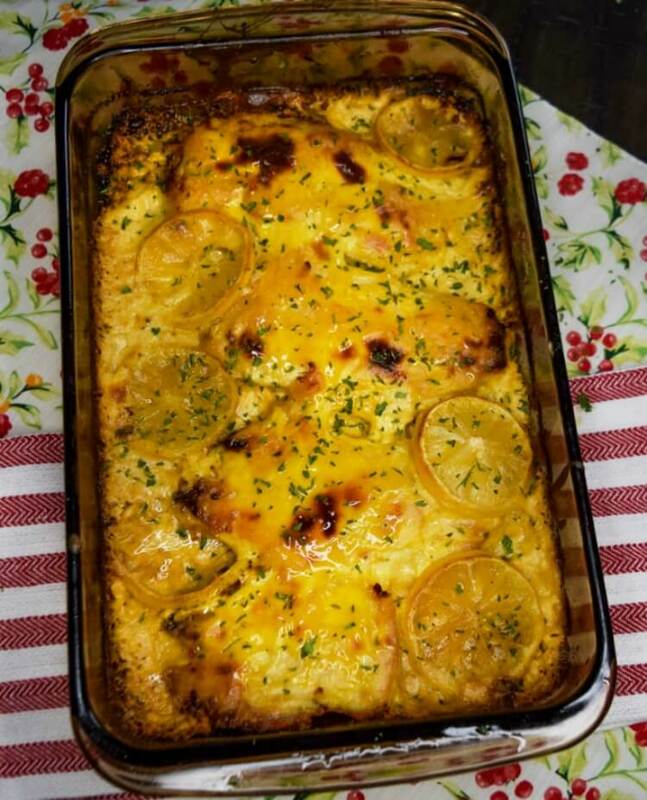 This Butter Baked Chicken is a family favorite. Yours will love it, too. Your chicken breasts will come out moist and fork tender for a delicious meal. And, you can use the soup leftover in the pan for a gravy over potatoes. Cut the butter into cubes and add to a 13 x 9 pan. Then, place it in the oven to melt. Mix flour, salt, pepper, and seasoning salt in a shallow bowl. In another shallow bowl, pour 4 oz of evaporated milk. Dredge each chicken breasts into the evaporated milk and then in the flour mixture. Put each chicken breasts directly on top of the melted butter. Combine the rest of the evaporated milk and the cream of chicken soup. Turn the chicken over and then drizzle the tops with the milk soup mixture until they are well coated. Pour the milk soup mixture all around the chicken. Don’t fill the pan completely up above the chicken, but add enough that it can be used as gravy. It’s optional to add thin slices of lemon around the chicken. I love it, but my kids don’t, so often I leave it off. Bake for an additional 30 minutes, until golden brown and soup mixture has thickened. Remove from oven and serve immediately with mashed potatoes. I had about 1/2 the milk soup mixture left over. I did not want the chicken swimming in it because it doesn’t brown as well. But, if you want to, go ahead. If you don’t have evaporated milk, whole milk or cream work well, too. If you have cream of mushroom soup, it also works well for the soup mixture. Did you know that dairy farm families are the source of the naturally good dairy products we all love? Our family goes through a lot of dairy products. Real butter is always my choice when I'm baking. My kids' favorite drink is milk, even my 19 yr old prefers milk over juice or soda. And, then there's cheese! Cheese is also one our favorite snacks, and I frequently include it in my recipes. I have a creamy cheesy pasta dish I'll be sharing with you soon that has five different dairy products in it, including three types of cheese. Oh, I can't wait! I love keeping things local. Did you know every time you purchase dairy products at your grocery store like milk and butter, you're helping support local dairy farmers and their families? We frequently stock up on milk, cheese, yogurt, butter, and so many other dairy products. It feels good knowing that every time I stock up, I'm helping locally. Looking for more recipes with dairy products? You can discover more at Dairy MAX.